What happens when Deaf and hearing emerging artists come together to devise new work? This program is provided in 2016-2017 under a contract with the John F. Kennedy Center for the Performing Arts. It is designed to provide enriching career development opportunities to Deaf and Hard-of-Hearing youth through the Westside Experiment. 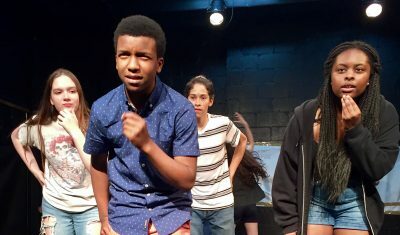 IRT’s Westside Experiment brings you a performance of original theater pieces created over a two week development process. Monique Holt is a performer, director, acting coach, script translator (including Shakespearean text to artistic sign language), visual/tactile interpreter and Director of Artistic Sign Language working with interpreters interpreting the shows. For 8 years, she worked as a teaching artist for MTC/Theatre Education Program and TDF/Theatre Access Project – Education Program. Under TDF, she visited 22 ‘K-12′ public/private schools and bring the students to see the Broadway matinee shows. Her trainings came from Merce Cunningham, Butoh, Commedia dell’Arte, Grotowski, Visual Gestural Communication (VGC) and Visual Vernacular (VV). She got her BFA in Acting, NYU and MFA in Theatre, Towson University. Julia C. Levy is Executive Director of Roundabout Theatre Company. In her 25 years with Roundabout, Julia has guided its growth from a small off-Broadway company to a leading not-for-profit institution. Prior to Roundabout, she held positions at the Boston Symphony Orchestra and Lincoln Center for the Performing Arts. She received her BS the University of Vermont and attended Harvard Business School Executive Education program. She currently serves on the Times Square Alliance Board of Directors and the NYC Department of Education Advisory Council for Arts Education. She is a frequent lecturer on arts management, sponsorship, governance and fundraising. Alexandria Wailes is a professional actress. Broadway: Spring Awakening (associate choreographer & Adult Woman), Big River. NY/Regional: Mother Courage (with Meryl Streep), A Kind of Alaska, Pippin, Sleeping Beauty Wakes (LA Ovation nomination). Television: Law & Order: Criminal Intent, Nurse Jackie. Film: The Hyperglot. Web Series: High Maintenance, Don’t Shoot The Messenger. AT&T’s Feel the Music campaign: Walk The Moon’s Different Colors. Ms. Wailes is also a member of the Heidi Latsky Dance Company. Besides endeavors within the performing arts fields, she is a museum educator for the Whitney Museum, The Jewish Museum and the Lower East Side Tenement museum. Kim Weild is a Drama Desk nominated director, whose work has been seen at Lincoln Center Theater, Carnegie Hall, Teatro alla Scala, New York Theater Workshop, Theater Row, Primary Stages, New York Live Arts, Mark Taper Forum and Williamstown Theater Festival. She is the Founding Artistic Director of OUR VOICES, a company dedicated to investigating themes of otherness in society. They created a world premiere American Sign Language production of Pinter’s A Kind of Alaska, weaving three forms of ASL into the text. Weild is a Visiting Associate Professor of Theater at Wesleyan University. Danica Zielinski is a graduate of the Masters of Secondary and Special Education with focus on English and Theatre from the National Technical Institute for the Deaf at the Rochester Institute of Technology. She had been a performer and writer for Dangerous Signs, An American Sign Language performance group, for the last four years .Last year she had the opportunity to perform in “Tweltfh Night” a Public Theater production at the Delacorte Theatre in Central Park through the New York Deaf Theatre. Favorite signing roles include Catherine in “Pippin” Peggy from “Godspell,” and Tracy Turnblad in “Hairspray.” Danica is a freelance theatre designer and has designed over fifteen productions. She is a merited designer through the Kennedy Center American College Theatre Festival. She looks forward to new production of a remake of “Tell Tale Heart” that she co-created and working on becoming a Certified Deaf Interpreter. Please visit and like Dangerous Signs on Facebook to follow to see future work. Malik Paris is from Philadelphia, born and raised. He has been performed and co-founder member of Dangerous Signs since 2011. Godspell as Jesus and Pippin as Leading Player at GEVA in Rochester and tour in NYC last year. He has worked with New York Deaf Theatre (NYDT) in TITUS as Aaron the Moor and Rocky Horror Picture Show as Riff Raff. He was pleased to work with both instructors and kids past two weeks. Lucia Constantino is a Long Island native who has been immersed in the Deaf community for most of her life. Learning from her immigrant parents and Deaf older sister, she has incorporated diversity and inclusion in her life with her peers as well as in her work. She has spent much of her high school career and summer vacations as a junior coordinator of youth ministry at Good Shepherd Church in Holbrook, NY as well as previous summers working as an assistant teaching at Developmental Disabilities Institute (DDI) of Long Island. She currently attends Rochester Institute of Technology where she is studying ASL English interpreting with an immersion in Deaf theatre to be able to provide access to and incision of the Deaf community in theater. She is a member of the ASL based performing arts group ‘Dangerous Sign’ performing in diverse plays and workshops in local theaters, elementary schools and universities for the past two years. She hopes to continue teaching acceptance and inclusion within theater and the Deaf community. IRT Theater is a grassroots laboratory for independent theater and performance in New York City, providing space and support to a new generation of artists. Tucked away in the old Archive Building in Greenwich Village, IRT’s mission is to build a community of emerging and established artists by creating a home for the development and presentation of new work. Some of the artists we have supported include Young Jean Lee, Reggie Watts and Mike Daisey. This program is supported, in part, by public funds from the New York City Department of Cultural Affairs, New York State Council on the Arts, and The Nancy Quinn Fund, a project of ART-NY. PLEASE NOTE: All sales final and there is no late seating at IRT Theater. © 2019 IRT Theater. All Rights Reserved.